New times, new vehicles and a new name are just around the corner! 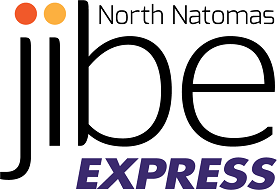 This summer, the North Natomas Flyer will be renamed to Jibe Express. With that new name will come brand new vehicles with improved Wi-Fi, a fresh coat of paint and a new route through the westside of North Natomas. With new vehicles come schedule changes. Rider feedback, ridership data, employee and resident commute data and geographical information mapping all influenced the changes. We aim to provide the most efficient, convenient and reliable service possible. Eastside Route (170) Two morning loops and one evening loop added. Westside Route (171) One evening loop added. Central Route (172) No changes. Midwest Route (174) NEW ROUTE - three morning and three evening loops. Other changes of note, "reverse commuting" will no longer be an option; and, by popular demand, the J at 14th stop downtown will be relocated to 15th at K.
Please don't hesitate to reach out to our office to discuss the service changes. High temperatures can affect operations of the Flyer Shuttle. We advise all riders to be aware of adjustments made during the summer. During this hot season, Sacramento Regional Transit big buses and smaller "neighborhood shuttles" will be used, instead of our regular Flyer Shuttles. This will occur on any afternoon that temperatures are forecast to reach at least 95 degrees, or if we are experiencing A/C malfunctions at any other time. When you name something, it becomes something! North Natomas has an extensive network of neighborhood off-street paths, but the lack of commonly used names creates confusion. In 2017, we reached out to the North Natomas community to choose a name for the 4-mile trail that runs north-south from Elkhorn Boulevard to Airport Road. Jackrabbit Trail was the resounding winner. We are excited to again ask the community to chime in on the names of two more trails in North Natomas. Trail #1 originates from Fisherman's Lake at Del Paso Road and runs north-south on the westside of North Natomas. Future plans will complete this 3.5-mile path all the way to South Natomas. Trail #2 is a 1-mile trail that runs north-south between East Commerce and North Park drives, traveling through Valley Oak Park and Redbud Park. Vote for your favorite trail name! Have you seen the crews out and about on the trails? Perhaps the sign or two notifying of bike path closures? 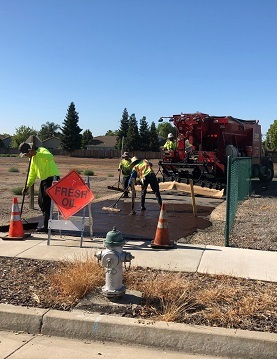 The City of Sacramento Public Works Department has been busy resealing the trails throughout Sacramento. This work is done as part of an annual program where once a year numerous neighborhood streets and bike trails are resurfaced. Nearly five miles of trails were recently resurfaced. Get out on your bike and enjoy their good work! J Street from 19th through 30th streets is undergoing a repaving and redesign. Construction includes lane closures on weekdays that may cause traffic to back up on J Street affecting the Flyer Shuttle. Construction is anticipated to last until August 10 and will result in a two-lane street with a parking-protected bike lane and improved pedestrian crossings. Sign up for real-time Flyer Shuttle alerts. Great changes are happening on Gateway Park Boulevard! 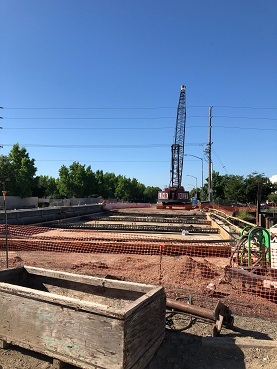 The existing bridge, between Arena Boulevard and Del Paso Road and currently accommodates two lanes of traffic, will be expanded to four lanes of traffic with a median, bike lanes and sidewalks. The bridge is a mitigation requirement of the Natomas Meadows housing project to the east. Construction of the project will result in an increase of bridge width by 40-feet and three inches, to a final width of 93-feet. The length of the bridge will remain unchanged. 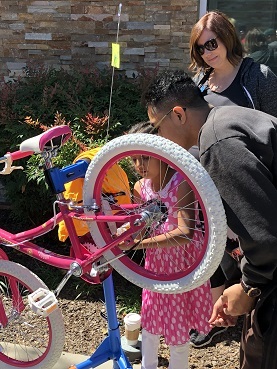 On June 10, the NNTMA partnered with the Active 20-30 Club of Sacramento and the Natomas Bike Shop for a volunteer bike build to benefit local kids in the North Natomas community. Bike mechanics from throughout the area volunteered their morning to assist with the build and ensure the bikes were ready to ride. CHP donated helmets and Mike's Bikes donated locks. This partnership with the Active 20-30 Club of Sacramento put more bikes into the hands of North Natomas youth, something we can all smile about. Interested in volunteering to build a bike? 50 Bikes for 50 Kids is only seven short months away. Stay tuned for more information.